The TC10 (10A, 15V) and TC5 (5A, 15V) are ultra-stable digital controllers for thermoelectrics and resistive heaters where tight temperature stability is required. Designed using the latest technology, stabilities better than 0.0009°C can be achieved with thermistors. High stability enables researchers to precisely monitor trace gases in fracking, bio-samples in life-sciences, and semiconductor performance. Tight control enables applications in electro-optics, imaging, spectroscopy, remote sensing, military, aerospace, communications, material procesing, and environmental or manufacturing control. 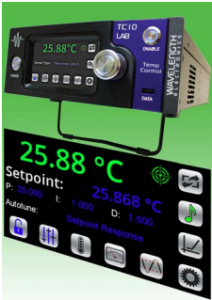 Intuitive touchscreen front panel – see setpoint, actual temperature, stability status all on one screen! Extra safety – shut down your laser / QCL / active load if it goes outside user set temperature limits. Auxiliary sensor can monitor heat sink temperature. Interface with the NEW IR Sensor to monitor temperature of liquids and solids REMOTELY, avoiding contact or contamination with the sample. 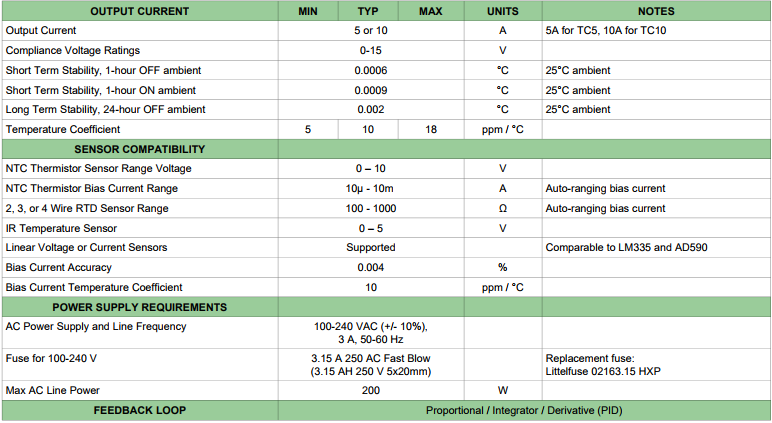 Compatible with all sensors – thermistor, RTD, LM335, AD590. Over and under temperature limits as well as positive and negative current limits can be set. If the sensor signal is lost or a short is detected at the thermoelectric, output current is disabled. If temperature limits are exceeded, a signal to the active laser load can be sent to disable its current. For example, connect the LD Shutdown BNC output to the Active Lock input on Wavelength’s QCL LAB driver and the QCL current will shut down if temperature limits are exceeded. An Auxiliary Sensor can be used to monitor the temperature of the system heatsink. Instead of long, manual calculations to derive the optimal Proportional, Integral, and Derivative [PID] control terms for a load, press the Autotune icon and the instrument will automatically cycle through a characterization test to tune the control terms for best performance. Two methods of Autotune are available. Setpoint Response optimization will minimize the time to temperature for the load. Disturbance Rejection optimization is best when there will be significant changes to the ambient temperature or operating condition. This could be for a pulsing laser diode where the active heat load changes or a sample that is to be tested in changing ambient temperatures.